I guess I could have jumped ahead to Thanksgiving pictures (since the table setting definitely makes one think of a holiday meal), but since this was my October project I was leaning more towards a Halloween layout. So I decided to just go for it. There’s no black, orange or purple, but since my daughter’s costume is pink I figured those colors wouldn’t really work anyway. 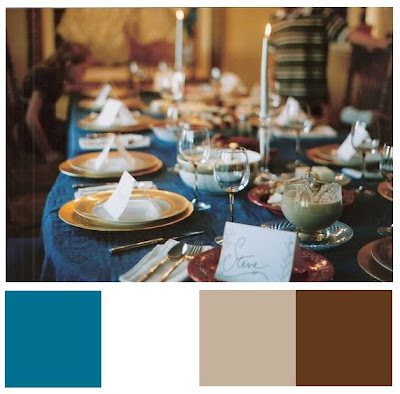 AND since the background of my pictures (our pool, and the cement wall) bring in blues and browns, this color combination is actually perfect. Obviously since I wasn’t using traditional Halloween colors, I also did not use a traditional Halloween collection or pattern. But, again, since my daughter’s costume is cutesy rather than scary, most traditional Halloween papers wouldn’t really work here. 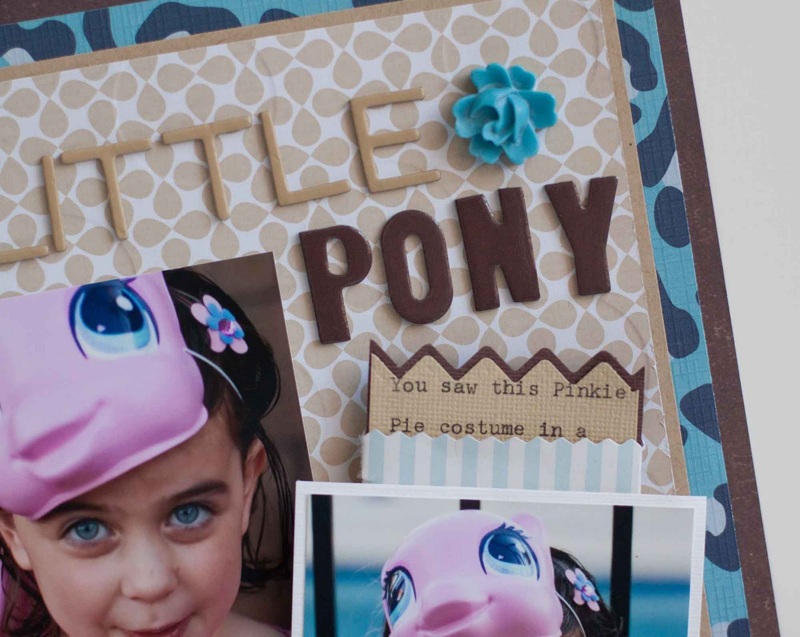 Instead I used an animal pattern from the Boys Animal Crackers collection (to go with the pony theme). I used a pocket from the Funhouse Collection to tuck my journaling into and one of those fun Cabochons too. 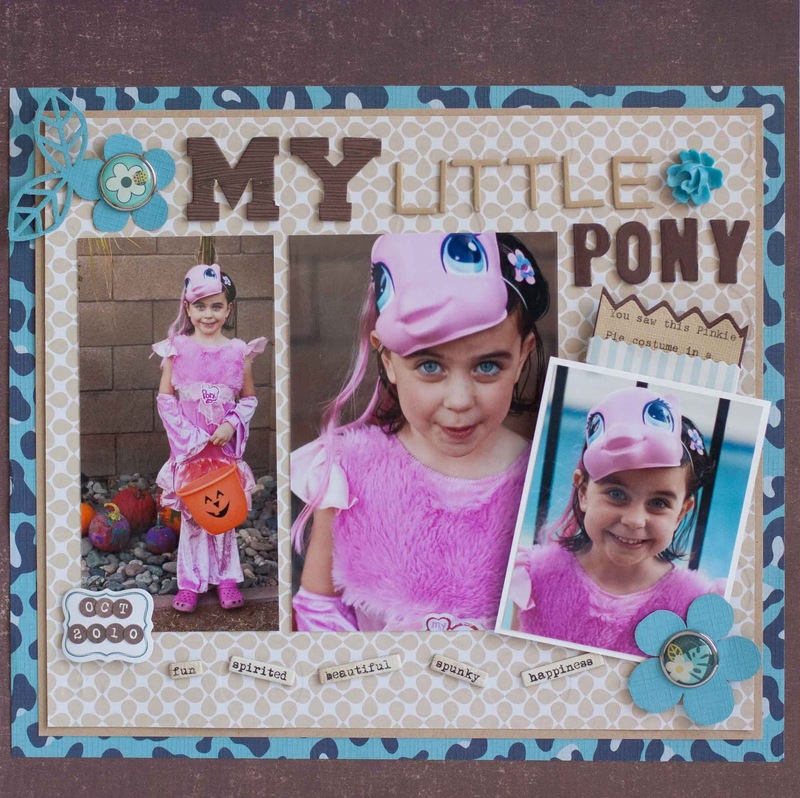 I am sure I will be using more nontraditional colors for this year's Halloween pictures too! GCD Studios patterned paper from the Boys Animal Collection and The Great Outdoors, Cabachons from the Funhouse Collection, Popcorn Journal Tags from the Funhouse Collection and Metal Rimmed Glass Brads and Die cut paper from the Boys Animal Crackers collection. WOW that IS a challenge but you did BEAUTIFULLY! I really like the colors and those pictures are just SO fun! I love it! I too have created a Halloween layout w/out Halloween colors and it came out just fine! I think it's good to step "out of the box" sometimes! Wow! That looks great! By using those colours you've really drawn attention to your gorgeous girl's pics! TFS! I love using unexpected colors for themed things...it really makes a great statement! OMGosh, how sweet!! You did a beautiful job with the challenge and I think your color combo worked perfect for the pictures!! This is so adorable, Rebecca! I love the use of the non-traditional Halloween colors here and you used the given color palette of the blue and brown tones just perfectly! Cute! How cute! You are never going to believe this but my daughter has the same exact costume this year...only the purple Starsong one. Too funny! I love the colors!!! And they are great with those photos, no need for black or orange! Congrats on your new DT position with Ruby Rock-it! Looking forward to working with you! this is gorgeous Rebecca, love how you showcased the GCD. Congrats on making Ruby Rock-It. Looking forward to working with you on another team! Congratulations friendly face on making it onto the Ruby Rock It DT!!! 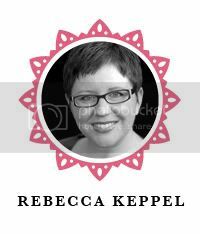 Such a beautiful layout, Rebecca! SO happy to be designing with you at Ruby Rock-It! BIG CONGRATS TO YOU! I was so happy to see your name on the list! Can't wait to design with you again!